This PDF 1.3 document has been generated by / Mac OS X 10.11.3 Quartz PDFContext, and has been sent on pdf-archive.com on 26/02/2016 at 20:20, from IP address 23.24.x.x. The current document download page has been viewed 409 times. File size: 422 KB (4 pages). We are excited about partnering with cannabis organizations, projects and people. Please contact ​ads@theweedblog.com​ to talk about how we can partner with you. cost per click (CPC ) of $1.90. contact us to discuss specific sponsored article campaigns. followers, TWB is the ideal platform to engage with the cannabis community on social media. products. ​A series of three Tweets from TWB on a single promotion starts at $250. mean lower cost per item. Please contact us to discuss specific sponsored article campaigns. 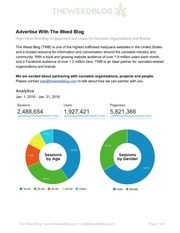 contact ​ads@theweedblog.com​ to talk about how we can partner with you. This file has been shared by a user of PDF Archive. Document ID: 00343639.